In these interactive special features, the editors of Chief Marketer go in-depth with leading brands and thought leaders to uncover the strategies, trends and tips marketers need to know now. Check them out for ideas to steal to supercharge your own campaigns. Walgreens, American Express and the YMCA share campaign details and candid insights on the new era of content marketing—what works, what doesn’t and what’s next. Plus, six tips for writing content with impact. Lessons from Diet Coke, State Farm and The Vitamin Shoppe on the art of modern influencer marketing—plus tips on how to prep contracts, create content and measure ROI. Go behind the scenes with 2018 PRO Award winning brands like Barilla, the NHL, Marriott Rewards, March of Dimes and more and learn the measurement strategies behind their top campaigns. What’s on the average CMOs mind? A simpler question might be what isn’t on a typical CMO’s mind. In the 2018 Chief Marketer CMO Roundtable, we talk with 20 leading CMOs from top brands like Citi, Bacardi, Grant Thornton, Bank of America and more to uncover the trends to watch. Sales and marketing ultimately have the same goal: to improve the bottom line for their organization. Why then does it often feel like they’re at odds with each other and not even playing the same game, let alone playing on the same team? Meet 10 up and coming marketers nominated by the editors and readers of Chief Marketer that we think have what it takes to move into the C-suite. Get to know these innovators from PepsiCo, ADP, Jack Daniel’s and more. Who knows? Someday, one of them might be your boss. Get the scoop from Chief Marketer’s 2018 B2B Trend Report on how to bridge the sales and marketing divide and find out what marketers wish the C-suite understood about their craft. 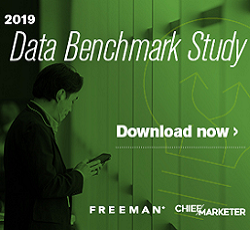 In this special report, we showcase how leading B2C and B2B brands like National Instruments, Pitney Bowes, Johnson & Johnson, Purina Animal Nutrition and more are using technology to manage data and drive marketing success.